A few years ago, I asked subscribers and nonsubscribers alike about "Bottle Types" and "What's Your Favorite Mosel Wine Label?" 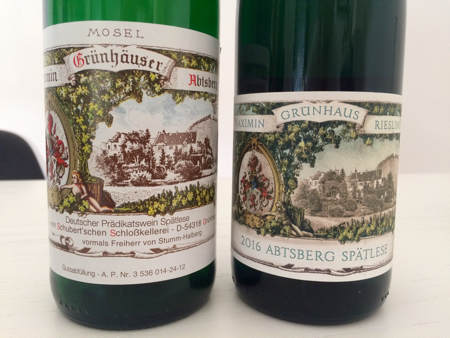 It's less important, to be sure, than the quality of what's in the bottle, and perhaps an issue on which I am overly sensitive, but I think it's time to talk about these matters once again, as another marquee estate has changed its packaging—namely, Maximin Grünhaus in the Ruwer Valley. "Good stuff, but still very disappointing that you can now capture all the label info in one shot: very un-Grünhaus[-]like," one commentator said, upon seeing the new 2016 Herrenberg Kabinett label on Instagram. He wryly added: "Etikettflurbereinigung...," which roughly translates to "label reform." (Flurbereinigung is a German technical term for the rationalizing and restructuring of hillside vineyards.) While I've read some positive responses to the new Grünhaus label, most people who I've talked with don't like it, especially diehard Grünhaus fans. "Don't get me started," one expert said, shaking his head. Another connoisseur of Grünhaus also had a negative opinion but said that he was obliged to keep quiet because of his work in wine marketing. There's something about the old-fashioned label on a 330-mm dark-green bottle that makes it timeless and worthy of appreciation. Joh. Jos. Prüm, Egon Müller, and Maximin Grünhaus are three of the most esteemed estates. It just looks odd when one of the three is repackaged in a modern way. The 34-ha estate also switched to a matching green capsule with the VDP logo of an eagle bearing a grape bunch, plus their Prädikat wines no longer have the triangular-neck label. I have yet to speak with Carl von Schubert about this redesign, but I did talk to his likable sales assistant Philipp Edel, who was pouring the Grünhäuser Rieslings at Carl Loewen for the Mythos Mosel event in May. Edel claimed that the taller bottle gives the Grünhaus wines more Wertigkeit, or worth, which, I presume, is supposed to appeal to a certain well-heeled clientele. Over the years, the von Schuberts have tinkered with their portfolio, nomenclature, and packaging. 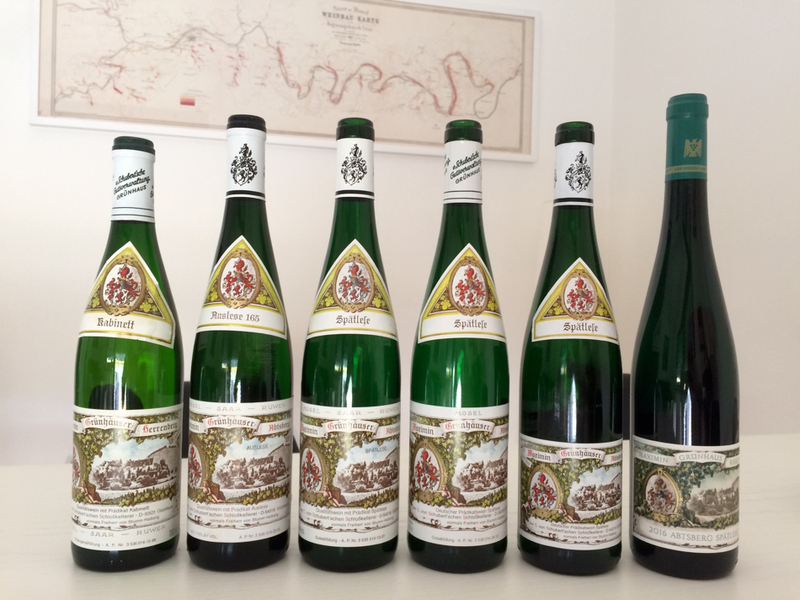 But other than the deluxe Superior Rieslings (first vintage 2005) and the newish Fusion bottling, both of which were always in the taller 350-mm Schlegel bottle, they kept to the typical 330-mm dark-green bottle for most of their wines, though much of it was screwcapped. The only other Rieslings in the extra-tall long-necked bottle came with VDP membership—namely the GGs, or Grosse Gewächse. The high-end Superior and, later on, the other dry Grünhäuser Rieslings had a replica of this first-edition label; the sweet ones (with neck labels and Prädikats) had the standard label, which is better known but was reduced to a smaller format as well (see photo of the lineup at the top). The detailed label might have been difficult to read, but that was part of its charm. This made Grünhaus distinctive, much like its wines. Following the VDP's lead, von Schubert had pretty much removed the Prädikat language on all but one dry-tasting Riesling before becoming a member of this leading association. In the 2010 vintage, all trocken and feinherb bottlings had the retro Superior label and no Prädikats, hence no neck label, with one exception—the Herrenberg Kabinett feinherb. (In the 2013 vintage, all the dry Grünhaus wines, except for the basic one, had a new stylish neck label with a light-blue trim.) 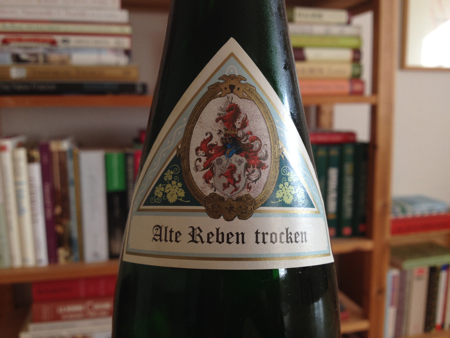 Kabinett trocken, however, was finally discontinued, just Herrenberg and Abtsberg Qualitätswein trocken. What a shame. If you've followed along until now, there have been further changes to the portfolio with the 2016 vintage. I don't have an overview yet. If it were me, I would have kept to the plain 330-mm dark-green flute. (One could make an exception for the Superiors and GGs.) I would have gone back to the big label (pre-2012 vintage), with "Mosel" at the top, yet the first Jugendstil rendition with the old typeface, as in the image of the 2006 Abtsberg Superior label below. I would also have the neck label. But I like old-school. Image courtesy of Maximin Grünhaus. 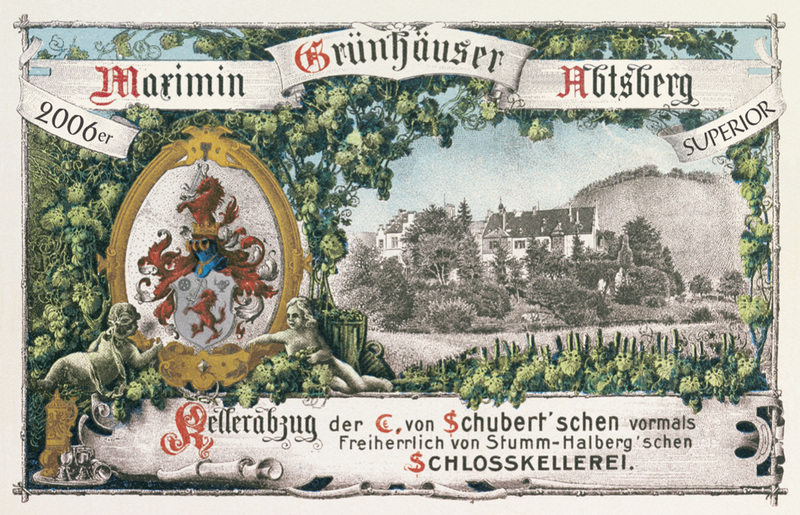 In recent years, Selbach-Oster, Schloss Saarstein, Martin Müllen, and the Karthäuserhof have new labels. I've heard mixed reactions to Selbach-Oster's label. I like it, even if the hyphen has gone missing. The Selbachs also stuck with the more modest 330-mm dark-green bottles. One quibble: they bottle more under screwcap, including their Kabinett wines. I prefer natural cork, especially for wines that can mature in bottle (for more on this, see "Why Screwcaps?"). Schloss Saarstein also kept to the 330-mm flutes. I'm less keen on the changes made by Müllen and the Karthäuserhof. Both chose the taller flutes. A friend said that the Karthäuserhof should have done a relaunch with a true retro label, like the 1959 Sang feinste Auslese. I couldn't agree more. Other producers have made more subtle changes. For example, I really like what Medienagenten—which also redesigned the labels for von Othegraven and Schloss Saartein—did with Max Ferd. Richter. Felix Eschenauer of Medienagenten said that they decided to keep the old capsules and reworked a 19th-century label from Max Ferd. Richter. I also like that Constantin Richter kept to the 330-mm bottles in dark green. That would have been my suggestion for Grünhaus as well. The photographer and winemaker Andreas Durst says it's "the only classic bottle for Riesling." The general trend seems to be more toward the taller 350-mm flutes and smaller cleaner labels, which require separate back labels. If the wine in question is designated as coming from a single vineyard, then only the site name is listed on the front label. The official single-vineyard name (which, usually, has a village or town name) is still required but put on the official (back) label. To take off the village or town name is an affectation, unless the vineyard in question was historically designated so, such as the Scharzhofberg or Bockstein.† Plus, there are many sites with the same name, such as Kupp, Herrenberg, or Schlossberg: why not list the village or town name, where appropriate, as was done in the 1890s? The fifties kitsch of Alfred Merkelbach's or Willi Schaefer's label is cult now and far removed from the modern labels created by graphic designers. Yong Truong, a Trier-based designer and owner of the restaurant Yong Yong, says that utilizing as many fonts as Egon Müller does on one label breaks all the rules of design, but he and I think it works with the Scharzhofberger label. Roman Niewodniczanski of Van Volxem has had success in marketing his wines around the world. The brand succeeds in no small measure because of the packaging of his high-quality Saar Rieslings. Roman is also a strong advocate of natural cork. Almost all of Van Volxem's wines are bottled under this closure, except for two new entry-level wines that comes in a standard Schlegel bottle topped with a Stelvin Lux screwcap. For the 2016 vintage, he has unveiled a heavy 350-mm bottle with the Van Volxem windrose logo embossed on it. Roman—who collects old price lists, manuscripts, and maps of the golden age of Saar and Mosel Rieslings at the turn of the 20th century—yearns for the days when the wines achieved such high prices as in its heyday. In order to meet this goal, he believes in promoting the best slate sites. Some argue, as Roman does, that the 350-mm bottle in antique blue is the classic height and color. While I've seen such exemplars, the boom years were only for a short time span and not all the bottles from this era were steel-blue. Mosel wine also came in green bottles. In and around Piesport, most of the top producers have the extra-tall bottles—Haart, Julian Haart, and A.J. Adam. Später-Veit switched back to the more modest-sized flute. It's a welcome change, particularly when so many want to be noticed and to keep up with the Joneses. "But I agree that extra-tall bottles are among the many things that for me scream 'I am insecure. Please look at how important I am!' (Hm .... sort of Trumpian bottles ... ;- )," says one sharp-witted observer. But I must say that Julian Haart and A.J. Adam have really good-looking 19th-century-label designs that fit well on the tall antique-green (olive) bottles. It's a matter of personal taste. What do you think? Please comment below. Extra-tall 350-mm bottles: Van Volxem, Nik Weis – St. Urbans-Hof (rebranded), Markus Molitor (rebranded), Clemens Busch (rebranded), Haart (rebranded), Julian Haart, A.J. Adam, Maximin Grünhaus (rebranded), Karthäuserhof (rebranded), Martin Müllen (rebranded), Günther Steinmetz (rebranded), Carl Loewen (rebranded), Piedmont (rebranded), and Dr. Fischer – Bocksteinhof (rebranded). Extra-tall 350-mm bottles only for the top dry wines, such as the high-end GGs: Ansgar Clüsserath, Forstmeister Geltz Zilliken, Dr. Wagner, Schloss Lieser, Fritz Haag, Dr. Loosen, Vollenweider, Weiser-Künstler, von Othegraven (rebranded), Reichsgraf von Kesselstatt, and Peter Lauer (rebranded, also bottles off-dry and sweet wines in this taller format). Standard 330-mm bottles: Joh. Jos. Prüm, Willi Schaefer, Egon Müller – Scharzhof, von Hövel (rebranded), Immich-Batterieberg (rebranded), Max Ferd. Richter (rebranded), Selbach-Oster (rebranded), Lubentiushof (rebranded), Knebel (rebranded), Heymann-Löwenstein, Stein, VOLS, Hofgut Falkenstein, Melsheimer, Vollenweider, Schloss Saarstein (rebranded), and Weingut O.
I only listed some of the top producers in each camp and mentioned, in parentheses, if their corporate identity was rebranded in the last several years. The only Grosser Ring member that now uses the tall, heavy GG bottle is von Kesselstatt. Dr. Loosen has an engraved GG logo on its 350-mm flute. The first two camps often put the "lesser wines" in the 330-mm bottles and under screwcap. †Today’s consumers will be even more confused by the new, similarly (and curiously) spelled VDP.GROSSE LAGE (“great site,” or grand cru)—the VDP is trying to mimic Burgundy with its own classification system, including the grand cru sites without the village name on the front label, and thus no Ockfener Bockstein (from the Bockstein vineyard of Ockfen). It’s just Bockstein now. This is problematic because there are many other sites with the same name, such as Kupp, Herrenberg, or Schlossberg. Bockstein is considered, along with the Scharzhofberg, to be one of the very best sites and was historically listed as just “Bockstein” or “Bocksteiner,” but many vineyards—like Ayler Kupp, Eitelsbacher Karthäuserhofberg, Dhroner Hofberg, Bernkasteler Doctor, or Trarbacher Schlossberg—included the village or town name in the 1890s, with an adjectival -er ending, indicating the possessive case, much like the vintage 2016er (from 2016). Especially to non-German-speakers, the labeling is almost humorously complicated. More producers are also eschewing the -er ending on the village (or town), vineyard, and vintage. I know it’s trendy among VDP members and nonmembers to copy Burgundy and leave off the village name, but only certain vineyards had historically no village name attached, like the Scharzhofberg, as mentioned above. This is different from changing, for example, “Saarburger Rausch” to merely “Rausch” and then putting “Saarburg Rausch” on the back label. 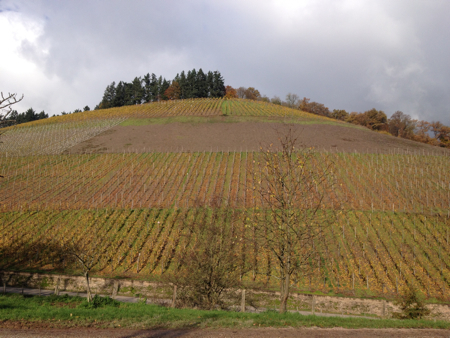 In the 1890s, the wines from this main south-facing hillside in Saarburg were called simply “Saarburger” (from Saarburg). Photographs courtesy of Nicola Ronde, who took these shots in his dining room in Trier. It’s kind of like Château Rayas keeping to the modest dark-green Burgundy bottle, while all the other Châteauneuf-du-Pape producers have used the embossed bottles with the papal tiara and St. Peter’s keys underneath (though I like this embossed bottle). Because of infighting between the two syndicates, Château de Beaucastel created its own embossed bottle for the 1996 vintage. It is a little taller and heavier. Château La Nerthe and Clos des Papes followed suit in the 2001 vintage with their own embossed bottles but with the same height and weight as the standard embossed bottle. The one syndicate came up with the futuristic La Mitrale, which was to celebrate the new millennium. (It reminds me of the Rheingauer Flöte.) Unfortunately, many producers use this, including Domaine Charvin and Château Mont-Redon. These bottles are said to be technically better and more conducive to a longer cork but don’t look as good as the old ones. What about the bottles for Burgundian varietals, such as Spatburgunder and Weissburgunder, which continue to grow in popularity for obvious reasons? Do other members prefer that these wines go in Burgundy bottles, or should flutes be used for Weissburgunder? Other suggestions are absolutely welcome. Yesterday, I picked up some wines that I had ordered some time ago, one of which was a Markus Molitor Wehlener Klosterberg Pinot Blanc 3*. While Molitor’s Rieslings have almost always been excellent in my experience, I found this particular bottle to be ostentatious and cumbersome. The bottle itself struck me as very heavy and showy, very much along the lines of some of the bottles from California that have been criticized as being excessive. Although I’ve had the opportunity to enjoy quite a few wines that came in such robust bottles, I would prefer that these producers use bottles that are more environmentally conscious, with less glass. If you want to make a statement with the bottle, design a label that stands out from the crowd in terms of artistic merit, and remember than bigger isn’t always better. Many of these wines already have a reputation that precedes them, and have no need to use such polarizing, ostentatious bottles. Hopefully, this Pinot Blanc/Weissburgunder shows more finesse and balance than the bottle that holds it. Given the elite winemaker and the three stars, I have high expectations that this will be an elite Pinot Blanc from the Mosel. There are still producers that use flutes for their Spät- or Weissburgunder. J.B. Becker, Schätzel, Karthäuserhof, VOLS, and Selbach-Oster come to mind. I prefer a Burgundy bottle for these grape varieties. I couldn’t agree more; Markus Molitor has rather ostentatious and heavy Burgundy bottles for his high-end Pinot Noir and Pinot Blanc wines.